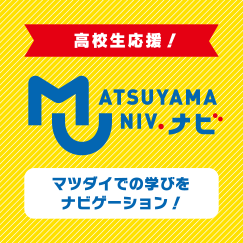 The Faculty of Economics provides the economic education to approach the society asking various talents, with the concepts of internationalization, informalization, modernization, synthesization and the emphasis in local communities, environments and human beings, in a spirit of establishment of Matsuyama University. The Faculty has been highly evaluated and expected by the local community as it has turned out many competent human resources. It is pushing forward with the aim of the further development along with the succession of the tradition. The feature of the Faculty is the three courses (The Synthetic Economic Policy Course, International Economic Course, The Community, Environments and Human Science Course) with a variety of unique subjects designed in order to encourage talents. For example, the two study abroad programs,‘ East Asian Economy’in Shanghai, China and ‘Korean Peninsula Economy’in Seoul, Korea are conducted every year. It also yearly offers the industry-government- academia seminars,‘ Venture Business and Market Economy’,‘International Sightseeing’ and ‘Cultural Economics’by visiting lecturers. In 2006, ‘Hometown Communion Seminar’ will be held with the cooperation of Matsuyama Chamber of Commerce and Industry. In 2005, the Faculty conducted ‘Local Industrial and Cultural on-the-spot Training’ and ‘Pilgrimage Visit to 88 Temples in Shikoku’ as an experience-learning program.